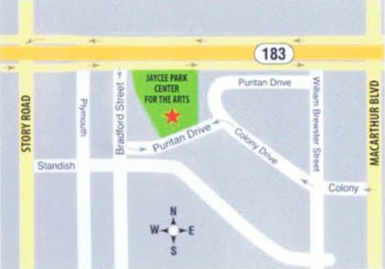 Meetings and exhibits of the Irving Art Association are held at the Jaycee Park Center for the Arts, located at 1975 Puritan Dr., Irving TX 75061 (see directions & maps below). Note: Before 2011, the physical address was 2000 West Airport Freeway in Irving (between MacArthur Blvd. and Story Road) but due to expansion of 183, the former entrance is closed permanently. Use our PO Box for mailings: Irving Art Association, P.O. Box 153581, Irving, TX 75015-3581. Map that shows alternate routes to the center effective May 2012. For information on 183 road closures, click here. Exit 183 to STORY ROAD – Continue through intersection on the frontage road. Turn at FIRST RIGHT on BRADFORD. Turn at FIRST LEFT on on PURITAN. JAYCEE CENTER is on the Left. Exit 183 to STORY ROAD – Turn Left onto STORY ROAD (go under the Freeway) and then turn left on the frontage road. Turn at FIRST RIGHT on BRADFORD. Turn at FIRST LEFT on on PURITAN. JAYCEE CENTER is on the Left. Exit 183 at MACARTHUR BLVD. Turn Left onto MACARTHUR BLVD. Turn RIGHT onto COLONY DRIVE Follow COLONY to PURITAN. Turn Left at PURITAN. JAYCEE CENTER is on the Right. Take BELTLINE South to IRVING BLVD. Turn Left at IRVING BLVD. Turn Left at STORY ROAD. Turn Right at STANDISH. Turn Left at BRADFORD. Turn Right on PURITAN. OR Take Beltline to 183 FWY to Dallas. Exit 183 to STORY ROAD – Turn Right onto STORY ROAD. Turn at the FIRST LEFT on STANDISH. Turn Left on BRADFORD. Turn Right on PURITAN. JAYCEE CENTER is on the Left. Take MACARTHUR BLVD. Pass under the 183 Fwy. Turn RIGHT onto COLONY DRIVE. Follow COLONY to PURITAN. Turn Left at PURITAN. JAYCEE CENTER is on the Right. Turn Left at COLONY. Follow COLONY to PURITAN. Turn Left at PURITAN. JAYCEE CENTER is on the Right. 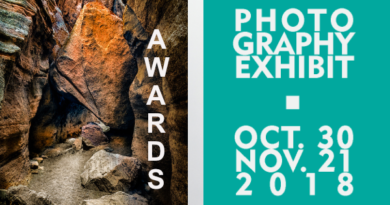 Gallery hours: Sun., Mon., Wed. & Thurs. 1-4pm and Tues. 10:30-3:00 pm. Closed Fri. & Sat and City Holidays and one Wed & Thurs each quarter for City Maintenance. IAA meetings are held at 7:00 pm on the fourth Tuesday of month, September—May. For directions to our sister gallery at the Irving Arts Center, go to http://irvingartscenter.org.